The Gansow Scrubber Dryers Are Extremely Robust & Come with A 3 Year Warranty. The Gansow range of scrubber dryers are extremely heavy duty and robust machines that can be used in the most heavy duty environments. The Gansow scrubber dryers come with a 3 year warranty as standard; offering you unrivalled quality and peace of mind. 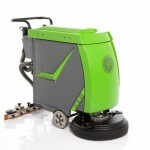 These machines are available from a compact pedestrian 26 litre through to a large 350 litre ride-on scrubber dryer. One of the best features of these machines is the water saving feature (GWS – Gansow Water Management System), this feature allows you to cover double the area on one tank of water than a conventional scrubber dryer providing you with both cost and time savings. The Premium Gansow range of scrubber dryers has various options including an Atex explosion-proof machine suitable for hazardous environments and an all stainless-steel version suitable for the food industry. PLEASE CALL US ON 01684 850777 FOR FURTHER INFORMATION OR A QUOTE!